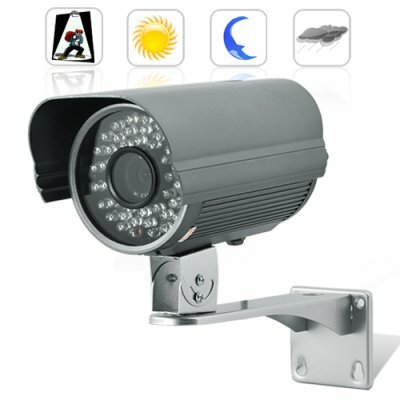 Successfully Added Security Camera with 1/3 Inch Sony CCD (Intelligent Motion Detection, IR) to your Shopping Cart. The I43 Security Camera comes in a mid-sized enclosure but provides you with the same technology found in full sized CCTV cameras. This perfect balance of camera size and image quality allows you to mount the camera in more locations than you could a larger CCTV camera, and without any loss in video performance. The I43 Security Camera is build with top grade aluminum and can withstand extreme weather conditions without fault. Rain, snow, humidity or intense heat do not effect this all aluminum weatherproof camera. Order the I43 Security Camera Sony CCD (Intelligent Motion Detection, IR) today and we will ship it out by tomorrow. Only from the leaders in wholesale electronics, Chinavasion!